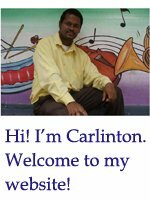 My name is Carlinton Singh and I am a music teacher and the webmaster of this great website. I guess you’re here because you want to know about me and this site. I hope I will do a good job talking about myself. Since you already know my name then it would be good to let you know that I am a Jamaican. I am not bias but Jamaica is one of the most beautiful countries in the world. I am a Christian who loves to read the Bible. I am friendly and easy to get along with. For the past four years the internet has become one of my favourite places of interest. I have been teaching music for over 10 years and I have been a musician since I was 10 years old. My two major instruments are the piano and bass guitar. I love music and love to teach others to play a musical instrument. This is my main reason for creating this website. So let me give you a brief history of how it started. In 2002 I graduated from college and started to teach music at the high school level. While teaching I realized that I was having a major impact on my students. As a matter of fact, I have helped to mold a number of musicians who are now very active in the music industry. Not long after, I started to do private piano and guitar lessons with children and adults. This was my part time job and still is. In 2010 I decided to take my love for teaching music to the next level. I wanted to impact others from different countries across the world, so I started to think about going online. Well, it wasn’t easy. I did a lot of research trying to build a website for myself. Yes, I wanted to do it on my own. But most of the content that is on the internet about building a successful website was not helpful at all. But I did not give up. The internet can be a hard place to accomplish certain goals sometimes. This is because lots of junk are uploaded on it everyday. However, there are some great resourceful websites on the internet. Thanks to Lisa Irby from 2Createawebsite.com and Darren Rowse from Problogger.net for their great articles and videos on how to create a successful website and online business. I must say that I have learnt a lot from these two great mentors and I am still learning from them. My knowledge about creating a successful website expanded when I joined “Site Build It (SBI)” owned by Ken Evoy. This great website was recommended by Lisa. This was in November 2011. I must say that I have learned a lot about creating a successful niche website. The resources that exist at Site Build It are plenty and are enough to make you into a great webmaster. “Site Build It (SBI)” is ideal for both new and experienced webmasters. The Site Build It action guide is great and their brainstormer keyword tool is excellent. Well I am still learning and following the tips and techniques that exist on their website. Thanks Ken for creating such a great resource centre. By the end of November 2011, I started my first website (choose-piano-lessons.com). I am still creating content and hope to reap success in the future. Click here to learn more about Site Build It! Here are some unique piano lessons that are on this website so far. FREE OF COST! I know you will find choose-piano-lessons.com to be helpful. I will be updating this website regularly, so please be on the look out for new information relating to piano lessons. If you like this, please share. Thank you! Learn To Make Money Online With James Scholes!